Indiana’s had stretches of strong play this season, only to fumble for equally long stretches, too. But tonight? The breakthrough. The Hoosiers put together a full 40 minutes of play in this one, en route to an impressive 20-point victory against Eastern Michigan. The Eagles played a Syracuse-esque zone against Indiana. In years past this would have thrown a shiver up the spine of the Hoosier Faithful. We all know why. But Indiana showed early and often it knew how to carve it up, the first play of the game a sign of things to come: A pass into the middle of the zone to De’Ron Davis, a pass from Davis to a streaking Juwan Morgan along the baseline, dunk, foul, and-1. From there, the Hoosiers kept it going. The ball movement was crisp and they’d continue to find their bigger bodies in the middle of the zone. And when that didn’t happen, Indiana was able to connect from distance over the top of it. The Hoosiers also made those hustle plays Archie Miller has been clamoring for, as Morgan hit the desk for a loose ball. And just as Indiana was playing with effort and showing it could succeed against a lengthy 2-3 zone, it was also taking serious care of the ball (9.2 TO% heading at the half). Indiana only carried a five-point lead into the break because it couldn’t contain Elijah Minnie (17 points, 4-of-6 from distance) and wasn’t great on the defensive whole either, allowing 1.14 points per possession to the Eagles. And as the second half began, Eastern Michigan continued to keep it close, pulling within 49-47 at the 14:32 mark. But from there, Indiana put on a 38-20 run the close out the game and finish it out in comfortable fashion. The Hoosiers got a bit better on defense allowing 1.09 PPP for the contest, and really turned it up on offense, punching up their points per possession from 1.29 at half to 1.42 for the game. That 1.42 points per possession against a Syracuse-esque zone came with a turnover percentage of just 13.1. Hallelujah. Good to see Zach McRoberts playing, and playing with confidence tonight. For a coach demanding a get-on-the-floor type of hustle at all times, it’s a little surprising McRoberts hasn’t seen much of the floor so far in the early season. He didn’t play against Howard, South Florida or Indiana State and saw less than a minute against Seton Hall. But when he finally entered the contest and stuck on the floor at the 13:27 mark of the second half, he got to work. In eight minutes of action, McRoberts scored four points on two strong takes to the rim and had three rebounds. Collin Hartman returned to the lineup for the first time in the regular season. And like he did against UIndy in Indiana’s second exhibition, he immediately splashed a 3-pointer. Hartman played just six minutes tonight as he works back from his groin injury. If the Cathedral product doesn’t regress health-wise, those minutes are likely to start creeping upwards during Indiana’s next slate of games. Speaking of that next slate, it’s upon us. Duke, Michigan, Iowa, Louisville, Notre Dame all to follow. It won’t be easy. But this one was no doubt a confidence builder and should help Indiana during its upcoming challenging stretch. Best I’ve ever seen an IU team ..attack a zone defense. In the past 15 years. They’re coming! For those who booed Archie Miller and his team in game #1 and then stayed home your shortsightedness was quite evident tonight as this team showed a glimpse of what IU teams of the future may look like. Hustle all the time, defense much better than before, and eight turnovers……eight freaking turnovers!!!! We had that many in the first five minutes of a game last year. What a breath of fresh air and we even witnessed a halftime adjustment by Archie Miller that paid benefits throughout the second half. There is light at the end of the tunnel!!! Got to see CH. So the wait is over. I’ll take more. I thought they really played well against a quality team!! I thought EM starting 5 was as good as half the team in the B1G just didn’t have the bench!! Archie is doing a great job!! 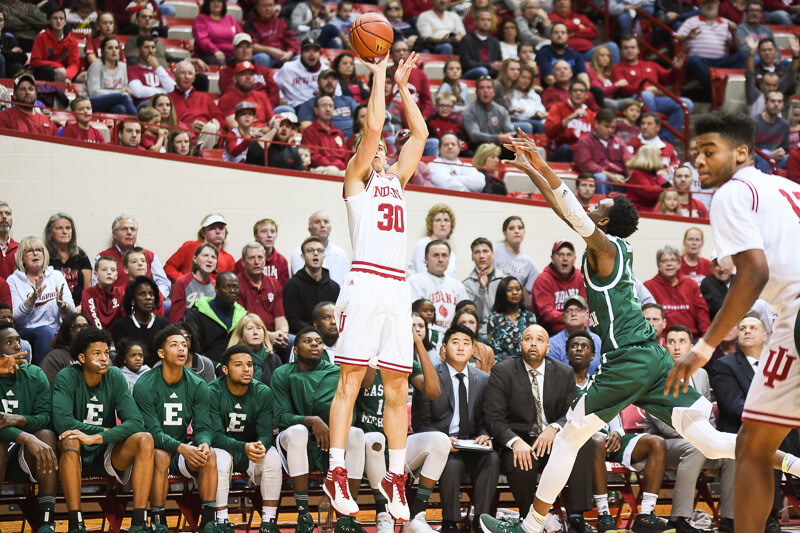 Like I predicted, much to the chagrin of a few youngsters here who are still learning how to recognize the ingredients for winning, Colin Hartman is undoubtedly the best all-around experienced basketball player and leader on IU’s team! I didn’t say tallest, most athletic, fastest, etc. His BB IQ superiority is recognized by his teammates and his presence on the floor immediately adds an intangible impact to the game! Stay healthy boys, and hopefully Archie will allow McRoberts & Moore more minutes! Go Hoosiers! I want to hear from some of the guys on this site who were claiming that Josh Newkirk is no good and should not be getting minutes. Come on now, I want to hear what you have to say. Because Not only did he play well today, but that is the Josh Newkirk that we saw in the last third of last season. I’ve been critical. Glad to see him succeed tonight. You know, it’s interesting. Archie did a masterful job of managing the roster today. It’s one thing to be deep, it’s another to have a coach who can plug and play them. It’s Syracuse-esque, just as described — having been brought over by a former Syracuse assistant. No, EM doesn’t have the same players, but we also beat them by 20 points. We handled that zone in a way we haven’t seen from an IU team in ages. I will not get ahead of myself. I will not get ahead of myself. I will not get ahead of myself. That is a patently false comment. Ive seen us shred many teams zones, with this kind of talent gap, it doesnt really matter. Josh I’m my opinion slowed his game down a bit, he played great. His minutes reflected his level of play. If DG doesn’t cut down on miscues, his minutes are going to go down. Listening to Archie’s press conference, I think he has seen enough in games and in practices now to use playing time to reward those that are performing in the games. Hopefully Collin is able to play some minutes moving forward so that gives Archie another resource. Zach did some good things tonight and is always going to give the hustle. I think Devonte and Curtis are going to have to work their way back into the rotation. Not saying they won’t play at all, but Archie has given them some opportunities and they are not yet performing the way he needs them to perform. I hope things click for them. We need them when they play well but Cujo seems lost most of the time and we are getting more bad Devonte right now than good. Watching OSU/Stanford ….I think IU, and most B1G teams beat OSU fairly easily this year. Just not very good. I don’t think I would complain about Newkirk or any player unless they are jerks and or disrespectful to the program. I do question his playing time which I think he is steadily getting better in Archie’s system. Devonte Green starting is baffling to me it has to be for his offensive abilities. Eastern Michigan was a tough team they looked really solid there RPI was around 143 good test. They made some rediculous tough threes as well. We just got better as the game went along. Great win! possible Big Ten 6th man of the year. He added great a great spark once he entered the game and gave the team a really big boost. It was very evident…much more than a simple single shot that went in. It really was a boost for the entire team. Yes, more please. Fellow Hoosier fan Marcus Gresham was on Jeopardy last night. Absolutely tore it up. Congrats, Marcus! And not do the subbing to where one is reminded of subbing from a hockey game. Didn’t surprise me with how he can pluck the most obscure IU bball fact from 20 years ago out of thin air in an instant. Well done Mr. Gresham ! Had his dad for a teacher in high school and he was a good one too. Shooting doesnt happen on accident. Im going to call out any writing around here that engages in ridiculous hyperbole. I’m certainly relieved that the site has you to keep things up to journalistic standards. And Excellent shooting isn’t a given.